Affectionately referred to both by Muslims and Christians in the area as Hadha Kasim, Fatima Siraj, 57, is a mother of three (her first born is Kasim Abdulah, 40, after whom she is known as Hadha Kasim, Mother of Kasim, in the local language Oromifa). Since the last 42 years Fatima is living in Assasa town, about 280 km south east of Addis Ababa, two hours walk from where she was born and raised. She moved to the town when she married Abdulah Ali, who died during Ethiopia’s civil war in 1979. After the death of her husband, Fatima has singlehandedly raised and schooled her three children: Kasim, Habiba, and Ysusf, all of whom married and living in the same town with their own children. She says her life, apart from the few ups and downs following the death of her husband, has been “like a paradise”: having able to educate and successfully marry off her children and “enjoying the privilege of spoiling her nine grandchildren.” But Fatima’s world came to an awkward twist in Nov. 2009 when police arrested her elder son Kasim on charges of “religious extremism and incitement.” In the two years that followed, Fatima says she has visited Kasim in Assasa prison every Sunday while he was facing charges at a local court. But since the beginning of 2012, Kasim was moved to an unknown location and no one is telling his mother where he is being held. Kasim was a businessman with two retail shops in the town which are no longer operational (the place is now marked for condominium construction). His friends say he became a different man since his first pilgrim to Saudi Arabia in 2000. “After the trip Kasim has financially helped build two mosques in the vicinity of Assasa town, he became outspoken about a different way of Islam, he started wearing trousers above his ankles and insisted his wife, who previously got along with just a headscarf, to wear Niqab,” said Kasim’s close friend, Mohamed, who only wanted to be identified by his first name and who was one of Kasim’s best men at his wedding. It was those changes that the government was after. Geographically a good number of Muslims in Ethiopia originate from eastern and south eastern part of the country. Assasa town is located in Arsi region, south east of Addis, and was an epicenter of a month long clash between the police and Muslims in 2011 that saw hundreds of Muslims rounded up in jail and a police station burned down by an angry Muslim mob who were protesting against the arrest of a local Muslim cleric, a frequent visitor to the Kingdom of Saudi Arabia, who the police accused was responsible for the creation of a contagious Wuhhabi sect. “For about a week the whole town stood still,” said Mohamed. Since the late 1999 and early 2000, Islamic extremism in Ethiopia has seen an unprecedented rise as several external and internal fertile conditions started sprouting. Chief among the internal conditions was the declaration in 1995 of a constitution in Ethiopia that guaranteed the right of individual freedom of conscience and religion, Art 27(1). While the presence next door of a lawless Somalia where leading international Al-Qaeda figures took refugees, was the major external factor. As Ethiopia’s constitution unwaveringly enshrined freedom of religion, Hajj and Umrah pilgrims by Muslims to the Kingdom of Saudi Arabia, the origin and stronghold of Wahabism, the more intolerant form of Islam, quadrupled in a span of ten years from a few hundred in 1995 to more than 4000 in 2005. The number jumped to more than 7000 in 2008, according to the Ethiopian Islamic Affairs Council. Many of these pilgrims come from Bale and Arsi regions in south eastern Ethiopia, areas largely inhabited by Muslims, who lived through untold political and religious repression in the past and to a certain extent the present. “The opening of such windows of opportunities to freely travel to Saudi Arabia have given birth to thousands of Kasims in Bale and Arsi regions,” said a senior police officer in Dodola town, 15 km on the road to Bale from Assasa and one of the towns in the area predominantly inhabited by Muslims. Since the last ten years the area known as western Arsi that include the towns of Assasa, Dodola, and Kofele as well as a small district called Kore near Kofele and the surrounding of Shashemene town further east have been placed under a particular radar by the federal and regional police for signs of violent religious flare ups. The latest incident during the Ramadan holiday in August took place in Kofele town when the police forcefully dispersed a demonstration staged by hundreds of Muslims as part of the ongoing Muslims protest against government interference in their religion. The police say they were after a cleric called Abdurahman Kabeto, known by many in the area and beyond as an “inflammatory, intolerant, open advocate of Wahabism and someone who took extreme religious teachings to the streets on more than a dozen occasions and formed a dangerous Wahabi sect with hundreds of followers”, said a police officer in the town. The feelings of ordinary people in Kofele town whom this magazine talked to are mixed: some view him as someone who threatened to destroy the social fabric in the area and beyond; some view his frequent travel to Saudi Arabia as purely religious and call him a revered Sheik; while others think his motives are simply financial (he is known for his generous money handouts to the poor). Seven people were killed in a shootout between the protestors and the police, and a police officer was wounded, but Abdurahman escaped unhurt and is at large with two other suspected extremists: Kasim and Haji Habib, according to information obtained from the town police. But elsewhere in Ethiopia millions of Muslims have been enjoying their rights to exercise their faith freely. Economically too businesses owned and run by Muslims throughout the country have boomed enabling thousands of peaceful Muslims to travel to Saudi Arabia for the yearly Hajj and Umrah pilgrim. The publications of newspapers, magazines and other religious books particularly in the capital Addis Ababa have started mushrooming; Islamic schools popped up in numbers; Awoliya College and Secondary School, a highly regarded Islamic school based in Addis Ababa next to the Grand Anwar Mosque, and which, despite all odds, has been around since the 1940s, has gained an unprecedented momentum in becoming a center of excellence for Islamic teaching; and the construction of new Mosques throughout the country continued at a rate many outside of the religion regarded with contempt. But it was not all too sweet. All the same, more and more young Ethiopian Muslims have become fanatics, finding it easy to associate Islam with the causes of Somalia and Afghanistan than a peaceful and tolerant religion that it is. Religious tolerance between Christians and Muslims throughout Ethiopia hit a rock bottom as violent confrontations between fanatics of both religions become common. At a May 2003 conference on federalism, conflict and peace building in Ethiopia organized by the Ministry of Federal Affairs and the German Development Agency, GIZ (then GTZ), Professor Medehane Tadesse, an Ethiopian expert on Horn of Africa political, religious and economic affairs and a consultant on conflicts in the region, said, “the religious equilibrium is collapsing very quickly.” His remarks then were rebuffed at best and received little attention. Although some claim that tensions started boiling after the 2007 population and housing census which revealed the religious composition of the country to be 62.8% Christians and 33.9% Muslims, signs show that it reached a climax in and after 2006 following Ethiopia’s decision to send its troops to Somalia to help the fragile country fight against Al Qaida affiliated Al-Shabab. The federal government spared no effort to control the widespread confrontation between Muslim and Christian fanatics throughout the country. Its response varied from stern warnings to detentions (including arbitrary) and jailing. As part of a frantic attempt, in 2006 the Ministry of education prepared a controversial directive that plans to ban all sorts of mass religious related activities in and around educational institutions. The draft directive bans group worshiping in educational compounds, spiritual teachings and the dissemination of messages that discredit any other religion via any means. It also prohibits the use of Niqab by female Muslim students. Initially the directive was met with an outright rejection by the then more independent Islamic Affairs Supreme Council but nearly five years later in October and November 2011, officials from the Ministry of Federal Affairs engaged in a nationwide discussion with officials from the Ministry of Education and higher education institutions in all the 31 state universities throughout the country to re-introduce the directive, which didn’t go well either. Muslim students feared the directive was too restrictive to practice their faith and have openly expressed their opposition. But in December 2011 that tension quickly gave ways to a new brawl between urbanite Muslims and the government following a decision by the Islamic Affairs Supreme Council, the highest body, to ban 50 Arabic language teachers from Awoliya College and Secondary School. 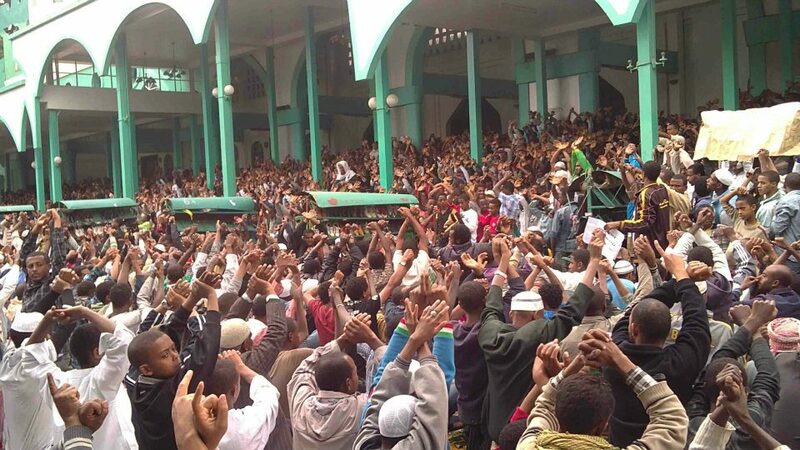 Thousands of Muslims in Addis Ababa believe the Council’s decision was engineered by the government, which they accused was also responsible for the dissemination of a new Islamic teaching called Al-Ahbash, a mixed dose of traditional Sufiesm, largely practiced among the millions of Muslims in Ethiopia, and liberal Islam, and was pioneered by the late Sheik Abdullahi Al Harari, an Ethiopian born religious scholar. The government vehemently denies that and insists it follows the constitutional principle of non-state interventionism in the affairs of religion. What started as a small gathering of protest by the students of Awoliya who lost their teachers to the decision of the Council has persistently spread throughout the country as millions turned every Friday for peaceful sit-ins calling for the government to take its hand off their religious affairs. Some of these events have turned violent resulting in further arrests and trial of many individuals including members of a transitional committee formed by the protestors to resolve the issue. Ethiopia is faced with an eminent threat of the expansion of Islamic extremism. There are thousands of Kasims throughout the country who are financially emboldened by external forces, mostly from Saudi Arabia. In western Arsi and parts of Bale regions hundreds of young and jobless Muslims are being lured by phony financial handouts from a number of extreme clerics; and hundreds of young Muslim men and women are being radicalized while attending higher education in various state run universities. In the last week of August the National Interreligious Council of Ethiopia in collaboration with the Ministry of Federal Affairs has organized a three-days national conference on national interreligious tolerance and peaceful co-existence in Ethiopia. Close to 2500 participants were brought to the capital to participate in this conference where no tone of compromise to accommodate the demands of thousands of Muslim protesters were uttered, but instead it was used as an opportunity to demonstrate just how bad Islamic extremism is. 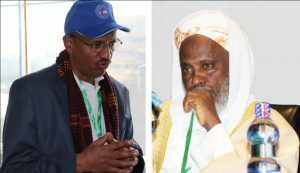 Almost everyone who spoke including Prime Minister Hailemariam Desalegn and Dr. Shiferaw Teklemariam, Minister of Federal Affairs, took the chance to warn and condemn the “delusional extremists” who are fighting to establish an Islamic state in Ethiopia. What is delegitimizing the government’s fight against the real threat of extremism is its (and its apologists) indiscriminate classification of the demands by thousands of Muslims as a call to establish an Islamic state and the government’s unrestricted use of state media to broadcast suspicious documentaries accusing jailed members of the provisional committee as “Jihadists.” Rights activists and opposition political party members know the dangers of extremism too, but show little interest to acknowledge its presence in the country. For them, it is a PR victory to show the brutalities of the police in handling the ongoing peaceful protests than the government’s fraudulent denial to distinguish between the real threat of extremism and the genuine demands of thousands of peaceful Muslim citizens. And urbanite enlightened Muslims are in denial of the existence of extremism in Ethiopia all together and more worried about their own rights than the agonies of hundreds of Fatimas in rural Ethiopia. Meanwhile, back in Assasa Fatima’s despair came to another twist when her 17 year old grandson, Kedir Kasim, failed to come home after the incident in Kofele. She says Kedir went to Kofele two days before the protest in the first week of August. Now she doesn’t know whether Kedir was one of the hundreds of protestors that were taken to police custody, or he simply vanished. “I can hardly bear the pain of losing my son to this confusion and now my grandson too,” Fatima who continued practicing Sufi Islam told our undercover reporters. Since his childhood Kedir’s religious upbringing was closely monitored by his father, who severed all his contacts with his Christian friends calling them “infidels” and loathed his Muslim friends for being “too traditional and cowards to stand up for their religion,” according to Mohamed, Kasim’s best man. In the town trust between Christians and Muslims has already become a rare commodity.